"Australia had its hottest day on record on Monday with a nationwide average of 40.33C (104.59 F), narrowly breaking a 1972 record of 40.17C (104.31 F). Tuesday was the third hottest day at 40.11C (104.2F). Four of Australia's hottest 10 days on record have been in 2013." "The road closed behind me," [Bonnie Walker] told ABC News. "We just waited by the phone. We received a message at 3.30pm to say that mum and dad had evacuated, that they were surrounded by fire, and could we pray. So I braced myself to lose my children and my parents." 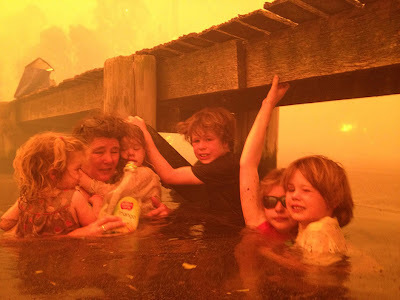 She described the photo of her family holding on beneath the jetty as upsetting. "It's all of my, our, five children underneath the jetty huddled up to neck-deep seawater, which is cold. We swam the day before and it was cold. So I knew that that would be a challenge, to keep three non-swimmers above water." Not unrelated, NOAA just announced that 2012 was the hottest year on record for the US.